Craigslist is my favorite marketplace to sell large items locally. Well, that could be because it’s basically the only option with a large following (other than Facebook garage sales). Regardless, Craigslist works and it works well, but that doesn’t mean it comes without its problems. After all, it is a marketplace and if you’ve ever dabbled in the resale game, even if you’ve just sold some old furniture or electronics, then you know how annoying it can be. Fortunately, though, there are ways to avoid or at least minimize the hassle of selling on Craigslist. No shows are rampant on Craigslist. By that I mean, people email, text, and/or call you to set up a meet up location where they can buy an item, then never show up. Whether it’s because there’s no accountability on Craigslist or just because people don’t care, it’s annoying – incredibly annoying. All kidding aside, whenever I get a call to set up a sale, I go through the normal negotiation process and set a meet up time/location. I then ask them to call or text me an hour before our planned meet up to ensure that they still plan on making it. If I do not receive a call/text from them, I will try getting ahold of them. If that doesn’t work, I assume it’s a “no show” event and move on. So far, this approach has worked quite well! I’d say *98% of the emails I receive regarding my Craigslist listings all say the same thing, “Is this still available?” In school, I was always told that there is no such thing as a stupid question. I now know that’s not true. Asking me if my item on Craigslist is still available is a stupid question and it’s annoying. So far it’s been working great! This annoyance is similar to the one above, because almost every spam email starts with (and ends with), “Is this item still available?” You could try to scam the scammers by getting them to hand transcribe hundreds of pages of Harry Potter or you could just ignore them and move on with your life. The choice is yours. Fortunately, you can avoid dealing with Nigerian princes, if you follow the rule of Annoyance 2: just don’t respond. Calls, texts, and emails are the name of the game on Craigslist. Without those three communication devices, selling things would be a nightmare (if not impossible). That being said, getting those calls, texts, and emails after the item is sold is annoying. Even if you always take your ads down after the items sell, you’re still at risk of rogue communication. For some reason, people save numbers and emails and decide to contact you long after you sold the item. Occasionally, the person contacting me doesn’t even remember what exactly the item is. The most effective way to avoid this is to use Google Voice. I never give out my personal cell phone number. Instead, I give out my Google Voice number and use Google’s app on my phone. Not only does that make communicating with people easier since it can be done on pretty much any device that has an internet connection, but it also gives you the ability to block numbers and turn off communication (delete or pause the app) at any time. Craigslist is far from perfect – I mean c’mon, their design/website looks almost exactly the same as it did in the 90s, but the system works for reselling (especially large items), which is what’s important. 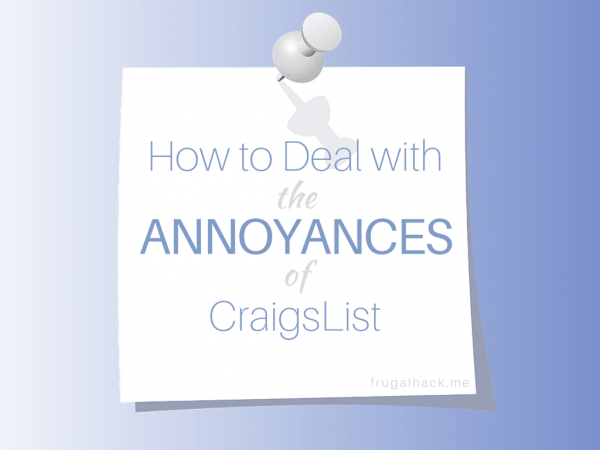 Hopefully, though, this post will help alleviate some of the irritations of Craigslist… at least a little. Do you have any Craigslist tips I missed?